Who else would love a pair of these? Hope they catch on! Perfect for getting in your runs at festivals or simply coping with the great British summer weather! 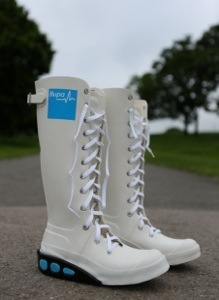 Jo Whiley will wear the world’s first “running wellies” at Glastonbury to keep training on track. Categories: running | Tags: Bupa Running, festivals, Glastonbury, myfirstrun, Running, running wellies | Permalink. I`d look bad enough in compression socks. Wellies and shorts would do nothing for me I`m afraid. They’re WHITE?? If it’s muddy they’ll be ruined in an instant. I have seen it all now!! Surely she could just wear trail shoes? Do they do a barefoot version too? Perhaps just with the bottom cut off?